Miscellaneous | Opel/Vauxhall sent out an intriguing invitation. In short it read: "Would you like to see the future of the car, then come to our proofing grounds in Dudenhofen". Being curious, Autozine went to Germany. There three test cars were waiting: the Ampera with "range extender", the fully electrical Meriva and a hydrogen powered prototype. The developers of each of those cars gave their vision on the future. The future is electrical, that's for certain with Opel/Vauxhall. However, it is not sure how that electricity will be produced. That is why solutions for today, tomorrow and the distant future were shown during the "eMobility" event. 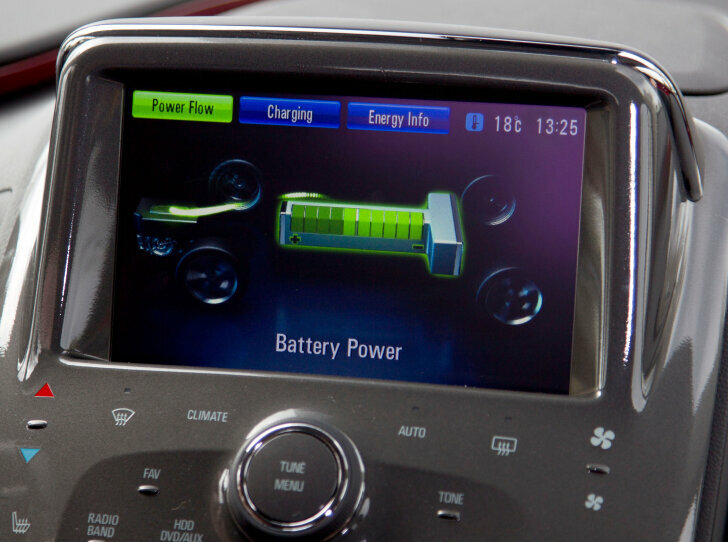 Cars with a petrol or diesel engine do in fact have their own power plant on board. The downside of this is that they cannot switch from one energy source to another. Electrical cars do not generate energy, they merely store it. It doesn't matter what the source is: coal, nuclear or solar cells; the car remains the same. The big advantage is that when a new source of electricity is found the electric cars do not have to be altered. The following example may illustrate the importance of this: if a 300 square kilometer area in the desert were filled with solar cells, it could power the entire world! Currently, electric cars have one huge disadvantage: the weight of the batteries is very high compared to the amount of energy they can store. To travel 500 km just 43 kg of fuel is needed. To cover the same distance 830 kg of batteries are required. On top of that batteries are expensive, making an electrical car with a range of 500 km unaffordable for most. This is why Vauxhall offers a short term solution with the Ampera. This car features both an electric motor and a petrol engine. Yet, this isn't a hybrid car. A hybrid car has an electric motor to support the petrol engine, with this "range extender" the roles are reversed. The Ampera can be charged at home and can then travel 60 km on electricity alone. Only when the batteries are depleted, the petrol engine starts. This engine does not charge the batteries or drive the wheels. Instead it supplies just enough power to continue for another 500 km on the electric motor. By extending its range, the most important problem of electrical cars has been solved effectively. According to Vauhxal the Ampera will do an average of 175 miles per gallon (CO2 emissions: 40 grams per km). 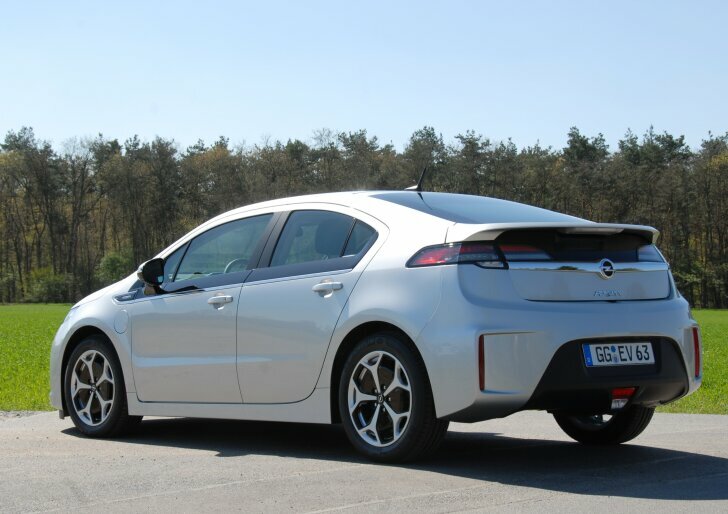 At this moment, the first examples of the Ampera are being produced. The cabin is very luxurious. The special layout of all buttons and displays, gives a futuristic feel to the car. Despite this, it is easy to find out how everything works and the driver sets of just as easily as with a normal vehicle. Thanks to its electric motor, the Ampera is quiet and very strong. Regrettably the car driven here had the suspension of the Chevrolet Volt (the Ampera for the American market), making steering extremely light and completely devoid of any feeling. According to Vauxhall, engineers are working on a version to suit the European taste. 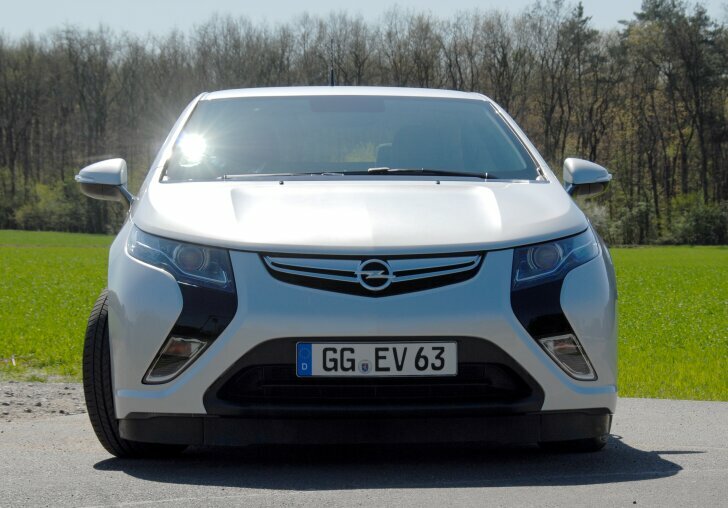 After 60 km the Ampera has to activate the petrol engine, because battery technology is still in development. Although batteries have become much smaller and lighter over the years, scientists do not expect any major breakthroughs in this field again. They explain this by showing which chemical elements are suitable to make electrons flow. At this moment the lightest and most effective elements are already in use, chemistry simply doesn't offer better building blocks. The only improvement can therefore be realised by fine tuning the process. Because Vauxhall wants to be able to adopt to any scenario, three Merivas have been converted to electric cars. These test cars are for internal use only and cannot cover more than 30 km. After this they have to charge for four hours. 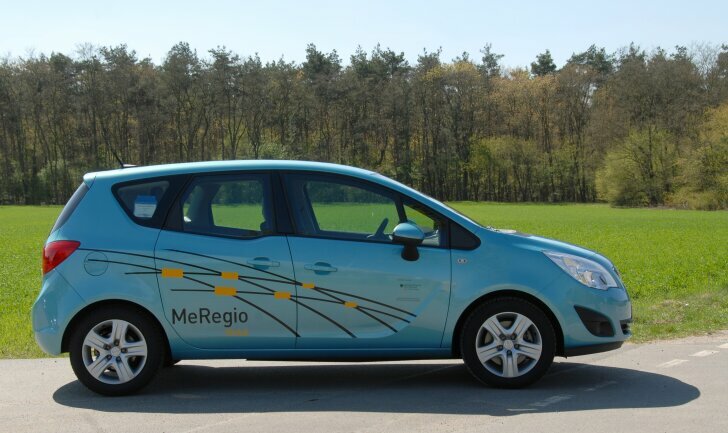 The Meriva's are mainly used for the "eRegio"-project, with which the German government wants to do research on the required infrastructure. For this purpose the three Merivas will do very well, despite their limited range. Although the electrical Merivas are hand made, they drive very well! 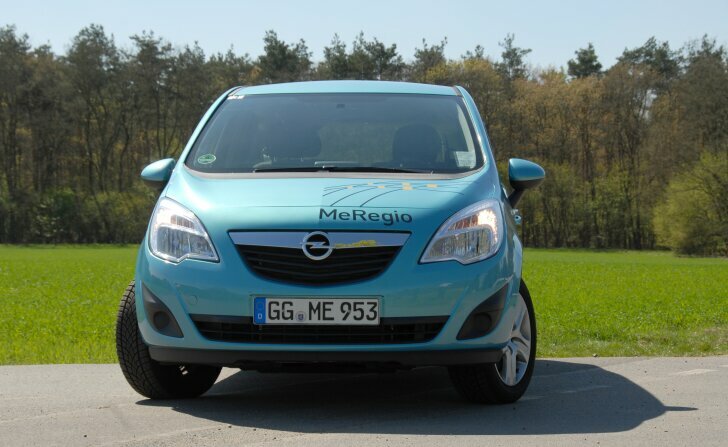 The tested car behaves as well as a normal Meriva. The displays that show the battery status and range have been integrated so beautifully in the dashboard, that it looks like the vehicle is ready for sale. A spokesman from Vauxhall emphasised that there are no plans to mass produce an electrical Meriva. Instead an electrical city car is planned. This small vehicle is meant as a second car in the household, for which a limited range is less of a problem. A second car is mainly used for city traffic and this is where not having any (direct) emissions is most important. For the distant future, Vauxhall bets on hydrogen. Hydrogen packs more energy per litre than petrol or diesel. Yet, it is as easy to refill (only for the owner of the car, the fuel station requires very complex technology). Hydrogen isn't burned like petrol or diesel. Instead it is forced through a membrane (the "fuel cell") which in turn generates electricity. The only by-product is pure water. The most important problem with hydrogen as a fuel, is the lack of an infrastructure. At this moment there are almost no (public) places to get hydrogen, nor is it being produced on a large enough scale. It is important to produce hydrogen in an environmentally friendly way, otherwise the problem is only moved away from the car to a factory. Another downside of using hydrogen is that is has to be stored under extremely high pressure (700 bar) and at a very low temperate (-40 C). This is why big, heavy tanks are required. 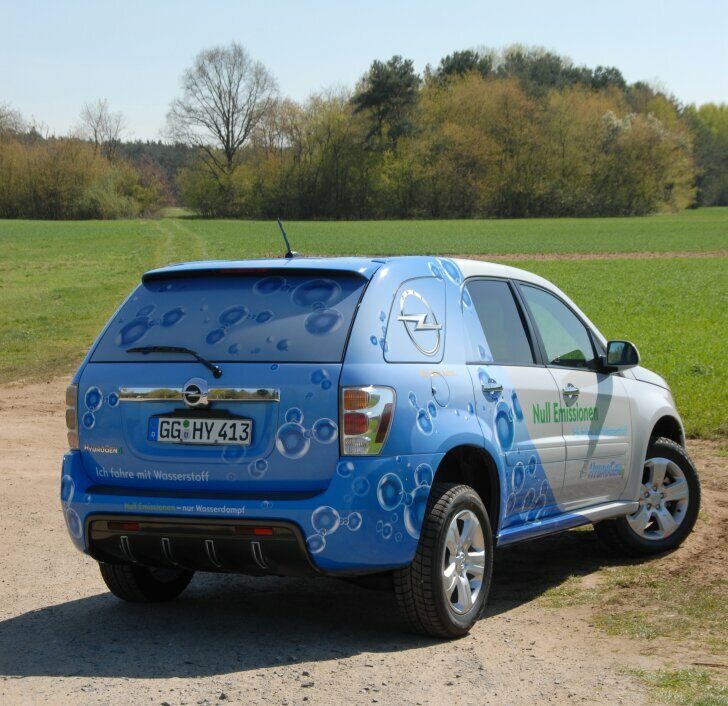 GM (of which Vauxhall is part) owns a fleet of 120 hydrogen powered cars, which are all based on the Chevrolet Equinox. This is a huge SUV which steers extremely lightly and is as stable on the road as a waterbed. At the first corner of the test drive it becomes painfully clear why this car isn't available in Europe. However, the test drive is meant to show that hydrogen technology works and it certainly does that! The "HydroGen4", as the test vehicle is called, performs very well. During the test drive the chief designer explains that many problems from the past have been solved. For example, the car can now also be used at temperatures below zero, while earlier test cars had a problem with ice blocking the fuel cell (which is where the water vapour normally remains). The electric motor and fuel cell also became smaller and more efficient than in previous "HydroGen" prototypes. This is why Vauxhall plans to market a mid-sized hydrogen vehicle as of 2015. Vauxhall organised the "eMobility" event to show its guests what the future might look like. In the very near future Vauxhall will introduce the Ampera: an electric vehicle which can cover 500 km thanks to a range extender. Vauxhall predicts that hydrogen will be the fuel for the distant future. 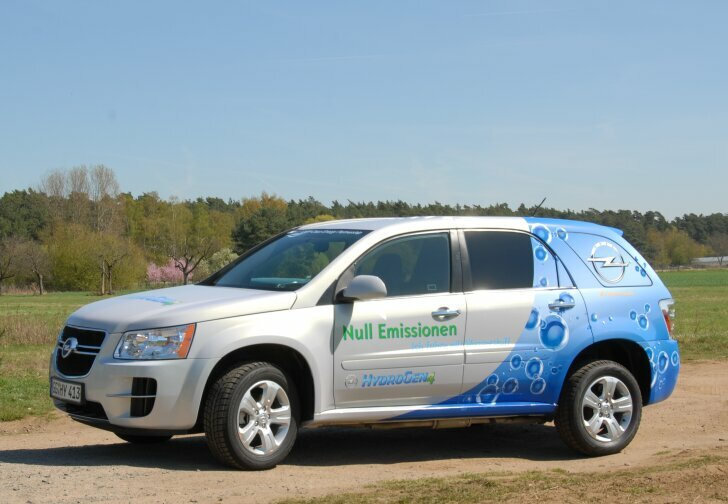 Just like an electric car, a hydrogen powered car produces no harmful emissions. Thanks to its quiet and strong engines, the hydrogen car offers more comfort than current vehicles. Unlike an electric car, the hydrogen car does not have to be charged. The range is equal to that of an average petrol car. Before hydrogen can reach the general public, fuel stations have to be build and technology has to be refined. After a day of test-driving and talking to scientists the most important question has not been answered: what does the future look like? The outcome depends on decisions of politicians and the demand from the customers. Vauxhall did show that it is ready for the future, no matter what it looks like.